Should You Steep Before Sleep? Photo by Nick Clements/Getty Images, with additional illustration by Lisa Larson-Walker. You’ve seen the cartons beckoning to you from the tea aisle of your local supermarket: a pajama-swathed teddy bear snoozing soundly in an overstuffed armchair, his nightcap snug on his head. A moonlit house settling in for the night, one lone window still alight. A nest of soothing herbs cushioning an alluringly steaming mug. These cuddly package designs belong to different brands, but their contents all promise essentially the same thing—an herbal tea to help you fall asleep. And why not? Humans around the world (especially British humans) depend on tea to wake up and more tea to make it through the day. 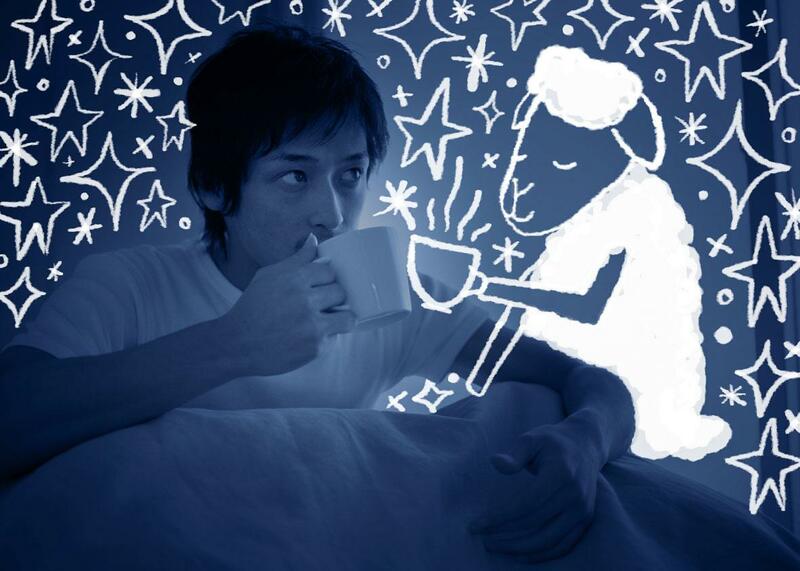 Having another cup of the stuff—provided it’s uncaffeinated, as all sleep teas are—before bed seems perfectly natural. But do these teas really work? Are all of them created equal? Could some or all of the drowsy effects they advertise actually in our heads? Does that really matter? To find out, I spent the twilight hours of the past few weeks digging into the research on sleepy tea’s ingredients and experimenting with an assortment of products on myself. I’m happy to report that, on the whole, I rested well—but I’m not sure I’ll be rushing out to buy another box. Before we get to that conclusion, we should be more precise about what “sleepy tea” means, exactly. I tried four brands—Bedtime by Yogi, Classic Sleepytime by Celestial Seasonings, Nighty Night by Traditional Medicinals, and Sweet Dreams by Bigelow. All of them tasted generally of a damp, grassy field dotted with wildflowers and punctuated by fennel fronds; some were more full-bodied or gently spicy (in a licorice, peppermint, or clove sort of way), but all shared a largely similar flavor profile. Celestial Seasonings and Bigelow favor chamomile as their primary ingredient, along with an assortment of mints and flower blossoms. Yogi features valerian root and shares with Traditional Medicinals a focus on passionflower as a central component, alongside chamomile and a mix of other herbs and spices. Those varying mixes of lavender, lemon verbena, and raspberry leaves are nice on the nose, but the true active ingredients to keep in mind are chamomile, valerian root, and passionflower. So just how active are those ingredients? Despite its reputation for making the most soothing cup, chamomile has not yet been scientifically shown to have a significant impact on various sleep quality measures. A small 2011 study did suggest possible “modest benefits of daytime functioning,” but found no difference in sleep quality between subjects given chamomile extract and those on a placebo. The evidence for valerian root is somewhat better—for example, a 2010 European meta-analysis of 18 previous studies allowed that “valerian would be effective for a subjective improvement of insomnia, although its effectiveness has not been demonstrated with quantitative or objective measurements.” This raises an important caveat to all this research: Every study I looked at was based on sleep diaries, meaning that subjects were responsible for reporting their own assessments of their sleep. Given the inherent subjective weakness of self-reports, this basically means that the results should be treated with a dash of skepticism. That passionflower and valerian root show the most promise for actual impact on sleep matched well with my personal experience. Yogi’s Bedtime, which contains both, had the most pronounced effect: While it did not make me drowsier than normal, I definitely experienced more intense REM cycles—evidenced by remembered dreams (uncommon for me) about a disturbing house fire and a delightful theme park—and I felt a bit more rested than normal the next morning. Similarly, Traditional Medicinals’ Nighty Night, which boasts 360 mg of passionflower, promoted a deeper sleep and left me satisfied in the morning. Meanwhile, the cups I sipped of Celestial Seasonings’ Sleepytime and Bigelow’s Sweet Dreams may have been relaxing in a cozy sort of way, but I could discern no real effect on my sleep once the lights were off. Of course, my anecdotal experience aside, it may well be that most of the effect of these teas comes from the pleasure of sipping a warm drink before bed rather than from any particular ingredient. Ritual is a powerful thing, and settling in for the evening to the sound of the simmering kettle and the clutch of a radiating mug certainly sets the scene for a good night’s rest. But other rituals could work equally well. Prior to this experiment, I’d been partial to a nip of cognac or bourbon over my bedtime book—the ritual of sliding under the covers with my glass was probably just as relaxing as any light drowsing effect the alcohol may have. And it’s news to no one that low-key activities like reading, list-making, or even praying are useful ways of quieting the mind and transitioning into sleep. In the end, my sense is that it’s this transition—this intentional period of moving from the stressful demands of the day into a more gentle mood—that’s important, not so much how you get there. If a particular sleepy tea seems to help with that in your specific case, by all means brew a cup. But don’t treat it as a guaranteed method or a magical remedy. Instead, look on it as a tool—one route among many that can take you to dreamland.